The bouncy castle with slide hire is a great little number, it lets the children have a good old bounce and when they have finished they can either jump off or come down the mini slide. This double inflatable is great for the smaller children and will allow the larger children to enjoy the bigger inflatables. The bouncy castle with slide hire is great at fun days and parties and is always a popular attraction. 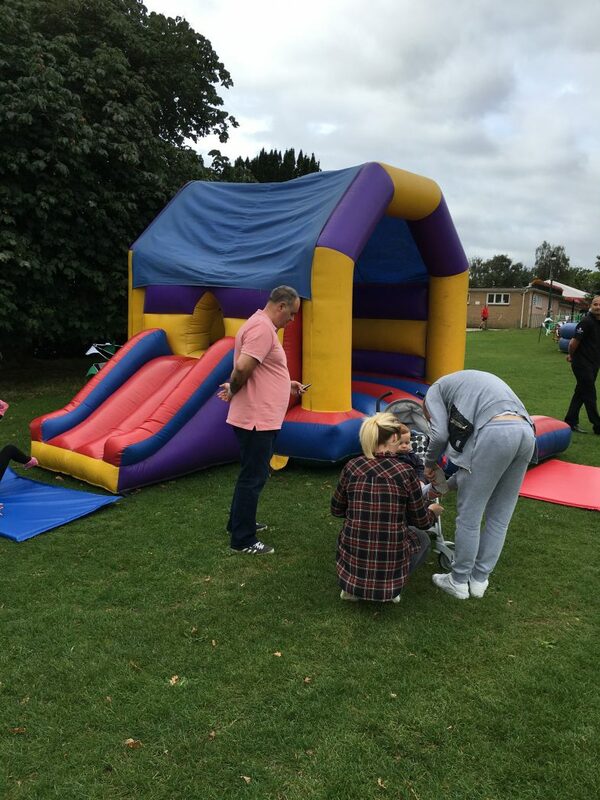 We have a wide range of bouncy castles for hire and also a wide range of inflatable slides for hire, so for the older children you could have one of the larger items. The ”bouncy castle with slide hire” is great fun and always comes with a supervisor and full public liability insurance. We have the full range of fun inflatables and they are popular at every event from a fun day to a private party. The great thing with the bouncy castle with slide is that it will fit in many indoor locations. Hire bouncy castle with slide and you get two great fun inflatables. The childrens bouncy castle with slide is great, when they have had enough bouncing they leave the inflatable on the mini slide. We hire childrens bouncy castle with slide to fun days and parties and it is always very popular. To hire bouncy castle or hire inflatable slide separately please give us a call. The bouncy castle with slide for hire is a great combination. The bouncy castle and slide offers the best of both worlds, we do have larger inflatable slide also available. To hire bouncy castle and slide or hire childrens bouncy castle options, we will advise you on the best inflatables for your event. The childrens bouncy castle hire is extremely busy all year round, for birthdays and parties. We hire childrens inflatables throughout the UK and the inflatables for children are some of our most popular items. For a party bouncy castle with slide or party bouncy castle you have come to the right place. We are one of the most established entertainment agencies in the UK and have been hiring out fun inflatables for many years. We offer a fully professional service and have a great safety record. When you hire the bouncy castle with slide or any other inflatable you will have a fun safe inflatable that all your guests will enjoy. The fun inflatables are great for the children, and when the children are happy the adults are happy. We can create the perfect mix of fun inflatables so that all your guests whatever their ages have fun games to play. Bouncy castle with slide hire is great at fun days.